April 7, 2015 (San Diego’s East County ) – Efforts to defeat industrial-scale wind turbine projects are uniting activists world wide—including here in East County. Donna Tisdale, Boulevard’s planning group chair, recently received a note from a Scottish group called Save Loch Ness asking for media coverage in the U.S. to help save one of Scotland’s most iconic and beautiful scenic areas. You can read or sign the petition at Www.savelochness.com and scroll down to read a press statement. This is a story of the extensive wind farm developments planned for the Loch Ness area. Essentially it is a piece about existing wind farms and the plans for more than 30 miles of windfarms submitted by several operators along both sides of the Loch Ness area. The total is 527 wind turbines in the planning process, thousands of tonnes of concrete and hundreds of miles of access roads. 1. Why is this an issue?? Loch Ness is the most famous lake in the World! Over 527 wind turbines have been approved or are in the planning process, covering an area of over 30 miles on each side of Loch Ness. Does this mean that the planning process is failing the area? Will this damage the tourist industry and unique and sensitive highland landscapes? 3. Can savelochness.com verify these claims and can you check the validity of these facts?? The windfarm figures and map shown on the savelochness.com website was provided by Scottish Natural Heritage, a Scottish Government agency. Look at the SNH website and see the map. These figures and map are also shown on the windfarm map of Highland Council. The beauty, fame and international interest and status of Loch Ness and the Great Glen are well known. 4. What is savelochness.com asking for? Planning protection for the area given the international importance of the location and the outstanding natural beauty of the area. Specifically the petition to the Scottish Parliament Petitions Committee asks for designation of the area as a National Scenic Area which recognises the special landscape qualities of the area. 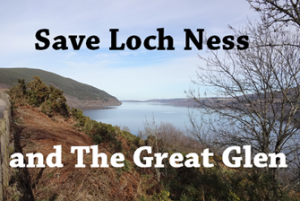 The petition asks that later an application is made by the Scottish Parliament for designation of the Loch Ness area and the Great Glen as a UNESCO World Heritage Site. A call is made to cease all current windfarm developments in the area and to carry out remedial action on damaged sites. 5. This is an important issue locally, but why would this story be of National and International interest? The Loch Ness area and the Great Glen are major tourist destinations in Scotland and the UK. The Loch Ness area is part of brand Scotland and promotes the country internationally. Many Scots, UK citizens and international visitors have a high regard for the outstanding natural beauty of the area and, can we say it, a strong emotional attachment to an area that epitomises Scotland. The unique upland highland areas are part of the last refuges of wild land in Europe. People are seeking justice in planning and ethical decision making in protecting special places in the World and Loch Ness and the Great Glen is one of these special places. The Loch Ness area and the Great Glen could be changed forever in the next few years and it is an area of international interest. 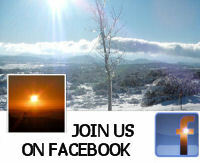 Also, a public debate and response on the issue is valued and comments by visitors are welcome. The Scottish Parliament Petitions Committee website gives an area for comment and the www.savelochness.com and Facebook link also give links for comment and feedback. The issue will then be discussed by the Scottish Parliament Petitions Committee after the closing date of 23rd April. As mentioned the website and petition give more detailed information and it shows the Scottish Natural Heritage (SNH) MAP of windfarm developments and applications.